Doctor Who star David Tennant's return to the stage as Hamlet has been named the event of the year by theatregoers. Some 35,000 people took part in the Whatsonstage.com Theatregoers' Choice Awards, which also saw Kenneth Branagh win best actor for Ivanov. Comic Eddie Izzard was named best solo performer for his show Stripped. Best actress in a play was won by Katy Stephens for The Histories, while Rain Man's Josh Hartnett was named London newcomer of the year. 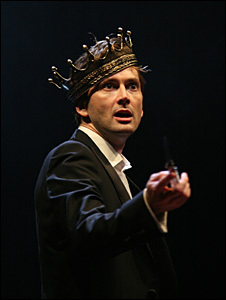 Tennant was forced to miss much of the Royal Shakespeare Company performance with back problems, but returned to the stage after surgery. The production, which moved from Stratford-upon-Avon to London, was also named best regional production. Josh Hartnett accepted his award from Los Angeles, where he said: "Being on stage in the West End production of Rain Man was a thrilling new experience. "Everyone worked incredibly hard, and made me feel welcome. I am thankful to the audiences for coming out and supporting us." Jersey Boys, which tells the story of Frankie Valli and The Four Seasons, picked up all four awards it was nominated for, including best new musical and best actor in a musical for Ryan Molloy, who plays Valli. Original Four Season and Jersey Boys composer Bob Gaudio flew in from the US to collect the best new musical prize for the show, which began life in New York. He said he and Valli were "absolutely thrilled" with the success of the musical. The Donmar Warehouse won five awards across three productions - Ivanov, Othello, and The Chalk Garden.